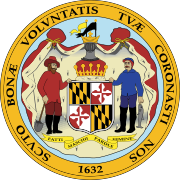 The 1980 United States presidential election in Maryland took place on November 4, 1980, as part of the 1980 United States presidential election. Voters chose ten representatives, or electors to the Electoral College, who voted for president and vice president. On election night, several news outlets actually incorrectly called the state for Ronald Reagan. In a similar vein, many of the same news outlets also called Massachusetts for President Carter, despite the fact that Reagan would ultimately end up winning that state by a very close margin. Maryland was won by incumbent President Jimmy Carter (D-Georgia), with 47.12% of the popular vote, over former Governor Ronald Reagan (R-California) with 44.18% of the popular vote and Republican US Representative John B. Anderson running as an independent candidate (I-Illinois) with 7.76% of the popular vote. Reagan ultimately won the national vote, defeating Carter. ^ a b "1980 Presidential General Election Results – Maryland". U.S. Election Atlas. Retrieved 8 June 2012. ^ "1980 Presidential General Election Results". U.S. Election Atlas. Retrieved 8 June 2012. This Maryland elections-related article is a stub. You can help Wikipedia by expanding it.